April | 2015 | Crafty Corner! As Craig Revel Horwood often say…an absolute disaster darling! I don’t know why I bothered. 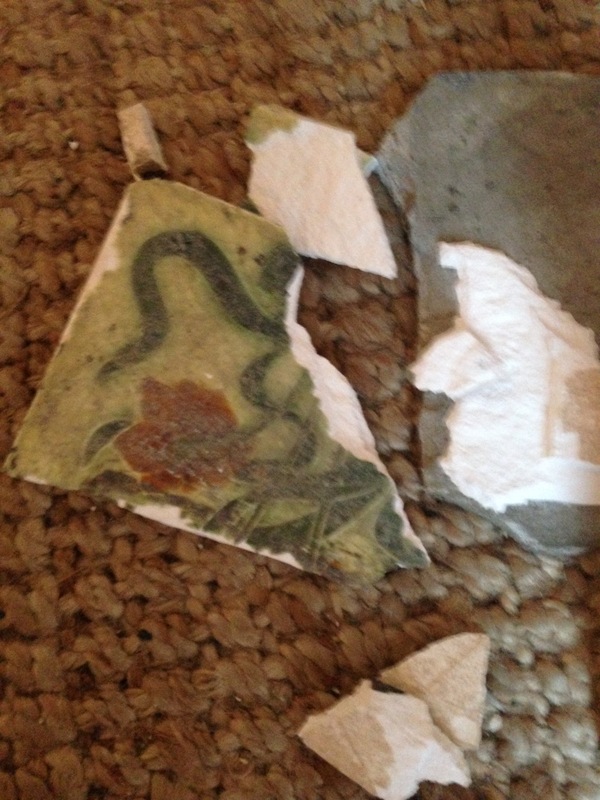 Ever since we moved into our new house, lover of all things antique I couldn’t believe my eyes when I saw hidden beneath some concrete were ORIGINAL VICTORIAN FIREPLACE TILES!! 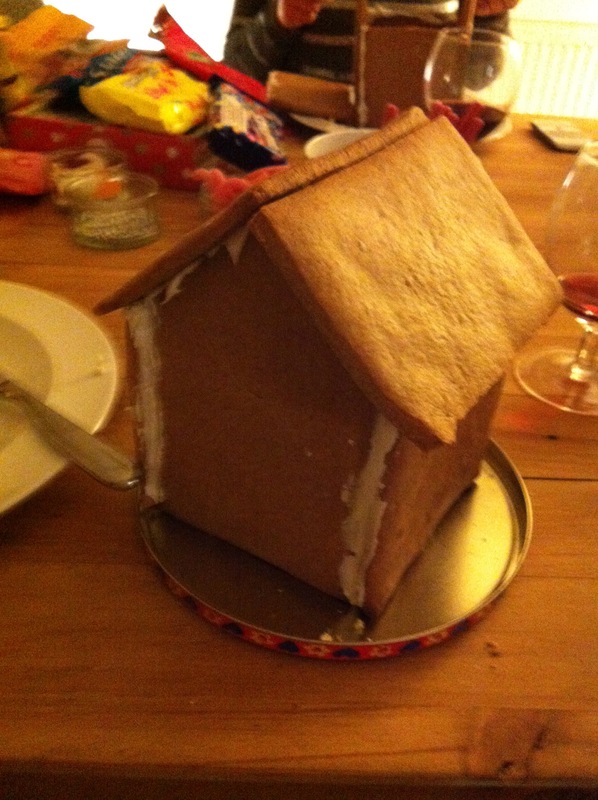 So what did I stupidly decide to do – I decided to start chipping away at them on none other than Christmas Eve!! Naive little me thought I would quickly chip away the concrete to be left with a beautiful tiles which I could polish up to perfection. Did that happen – of course it didn’t!! I was left with a crumbling mess which after much chipping away at, heaving and general high levels of frustration I was left with this.. So after a near melt down I did my best at patching it up, ready for the big day. It looked absolutely terrible. 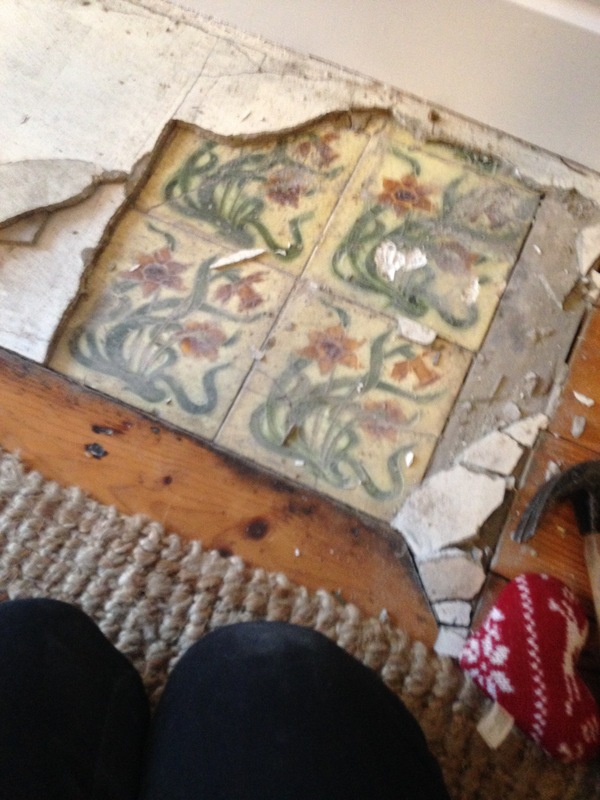 There were big white holes in the tiles, tiles that had broken up into so many pieces that it was the most difficult jigsaw puzzle I has ever tried to complete. But it was done, only to have my fabulous boyfriend the following day whilst laying the table put his foot through it. Surprisingly, I was incredibly patent with him, I think by that point I had lost the will to life with the tiles. For months a lovely cushion covered the hole and during the winter months a cold breeze crept in through the hole, only to wait until February when the concrete was back, covering the hole once more. Damn my eagerness to uncover lost treasures. I’ll definitely think about my timing a little more wisely next time. Other than the photos I took at the beginning there is no more evidence of the mess I made so apologies about that but it’s probably a good thing. I think I’d die of embarrassment. 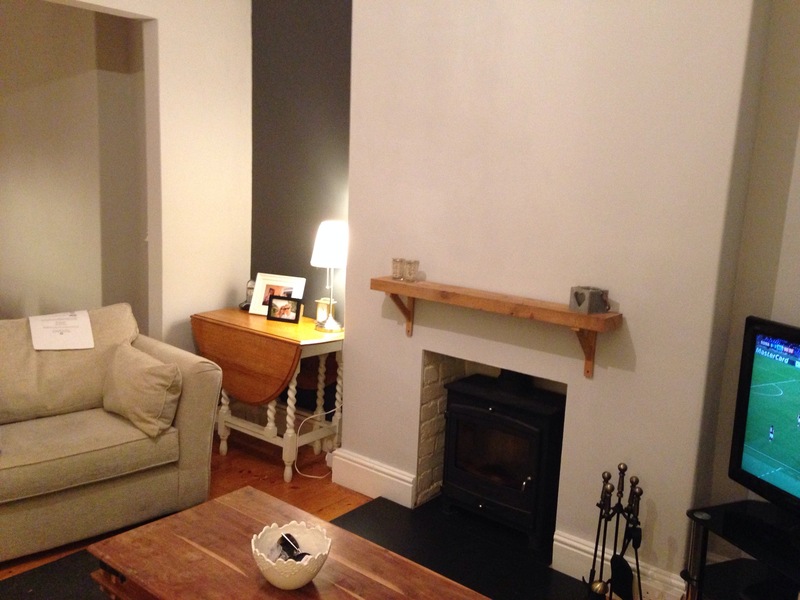 After more researching, saving and organising, the living room has finally been completed. It initially started with some damp rising up one wall – it looked terrible and we knew we would quickly have to get it sorted. During a couple of days off I used rated people to find a local tradesman, the guy did a quick and decent job (with us receiving a 20 year guarantee) until one of their tradesmen left with a piece of sound original architrave. 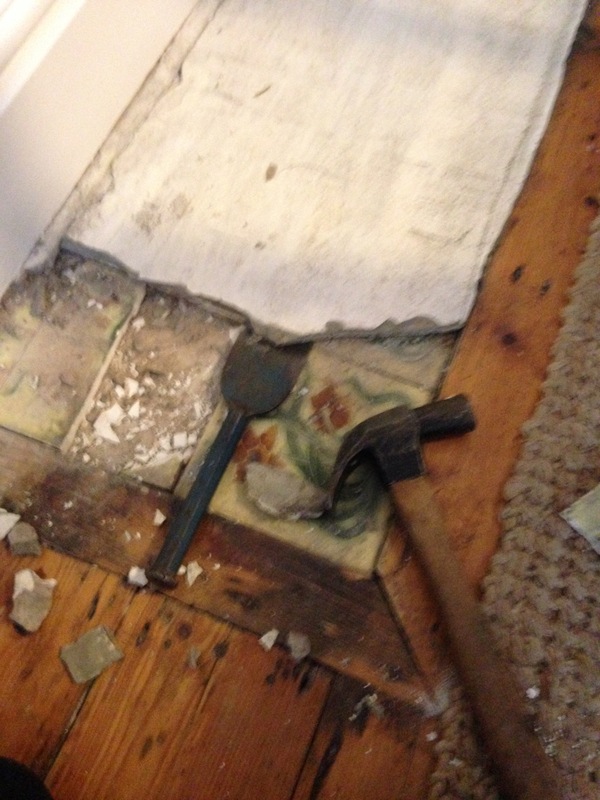 We tried to get it back but unfortunately it had been skipped – when one DIY job is done, ten more come about. We quickly painted it after plenty of consultation with which share of grey/charcoal to use where. We finally made a decision and we’ve really happy. 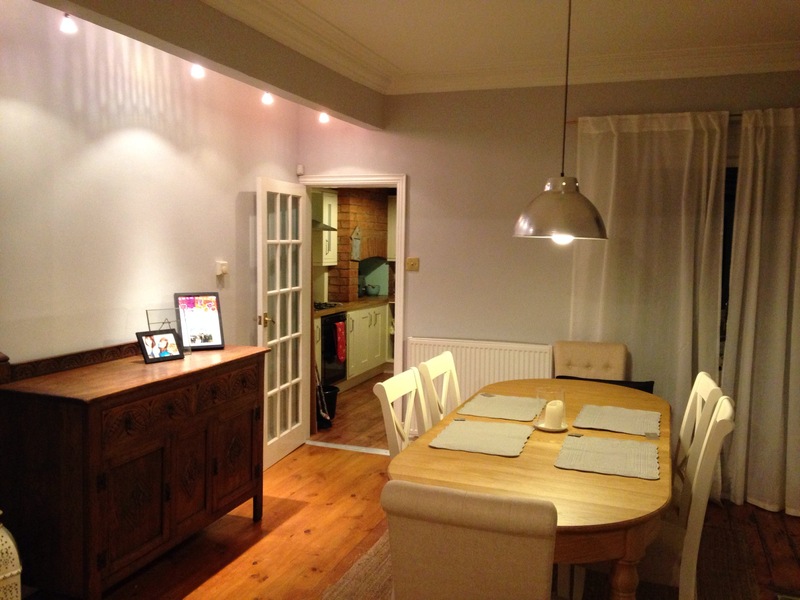 Our dining table arrived and looks the part, I just need to decide on an accent colour to brighten and lift the grey. My initial idea was turquoise but now I’m thinking about yellow however I know grey and yellow has been a ‘thing’. I don’t want it to look dated and over the top/obvious. Decisions, decisions. As some of you might be aware we hosted Christmas this year. It was a lovely day with my boyfriend’s family, yet busy and I wasn’t even doing the cooking! My boyfriend did an amazing job and we eat like kings for the day. His preparation commenced three days in advance, starting with a very late trip to Asda at 10:30pm; my bed time! It was a surreal experience heading to Asda at that time, especially as it was as busy as a normal evening after work. I did feel incredible smug when the following day my sister updated her Facebook profile with an angry emoji! 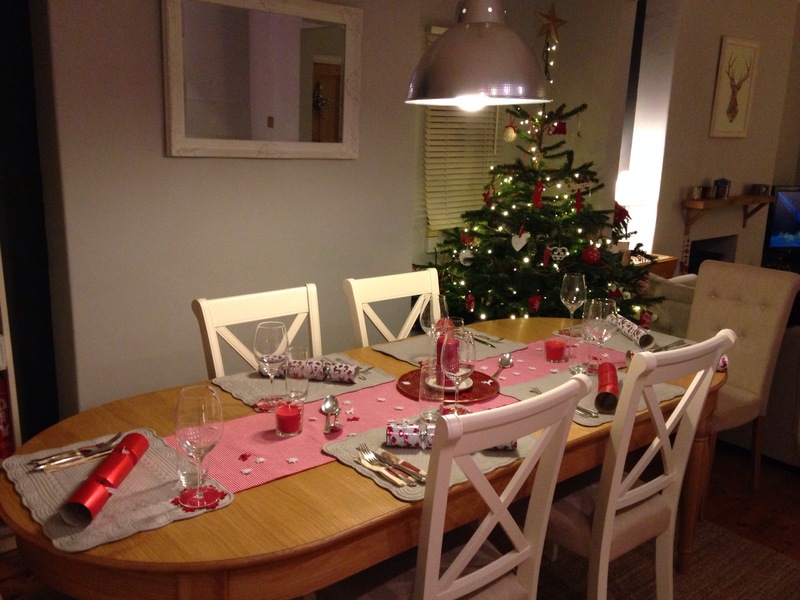 The preparations were definitely worth it as he put on a very impressive spread for his family. We were a well oiled machine we me sorting out snacks, drinks, canapés and my Gran’s Christmas cake for dessert and him cooking the main course. I hoping he feels up to doing the same again this year to welcome my family for Christmas 2016. I’ll give him a couple of months rest before I start planting that seed! I was really pleased with the overall finish of the table. I think it worked well with the rest of our decorations and theme. What do you think? Everyone loves a good tradition, and in our household we are no different. This tradition came about from our strange food competitiveness, originating with a ‘carbonara-off’ during one of our first few months of dating (I won), to our Christmas Eve tradition of cooking the Christmas ham. My stepdad lives in the roll countryside and loves nothing better than visiting his local butchers, so in the run up to Christmas we place our order and look forward to the delights of smelling that sweet ham cooking away, layered with Gordon’s delicious glaze. Over the years we have had some delicious hams which have kept our overloaded bellies filled up between Christmas and New Year. What better tasty snack than fresh bread, glazed ham and Auntie Janet’s homemade chutney!! Bliss! 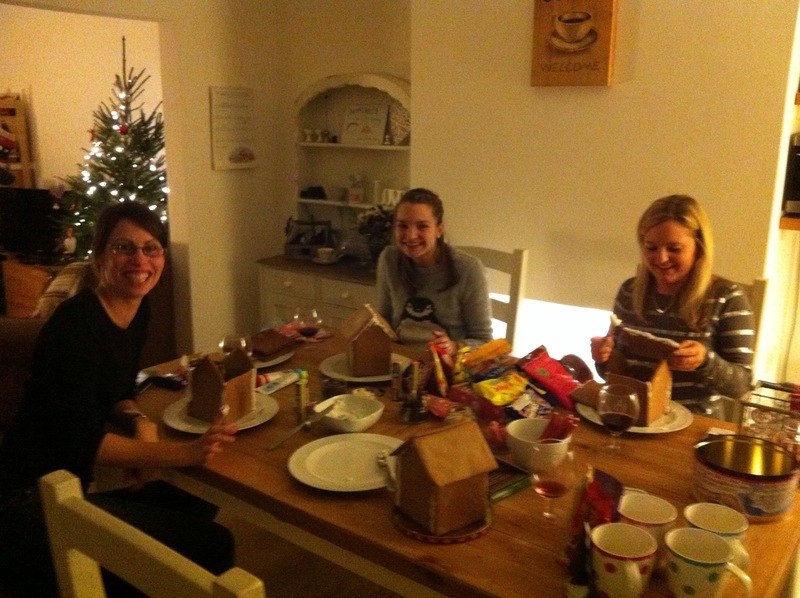 Before Christmas, my friend invited me round to make gingerbread houses. 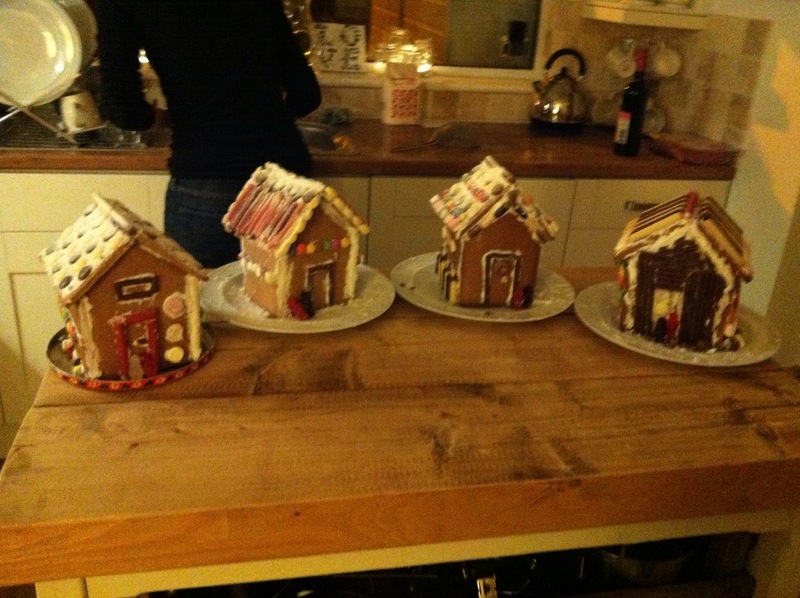 So I arrived, loaded with sweets, to decorate our gingerbread houses. 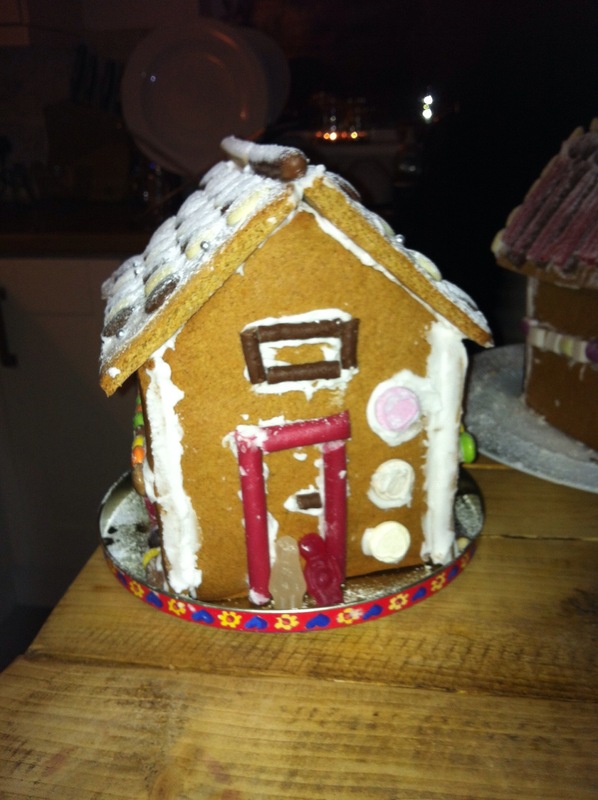 To make the gingerbread, she’d followed a pattern from Kirstie Allsop’s Christmas Crafts and all we needed to do was fix it together with royal icing and attack it with sweets whilst drinking mulled wine. What a perfect afternoon! It was pretty disheartening to break into it but it was perfect with a cup of tea on the lead up to Christmas when we had visitors. It seems pretty strange to be talking about Christmas on Easter Sunday – all this talk of sweet things is making me want chocolate – better go and finish that egg! Happy Easter!! I’ve been so lame recently. 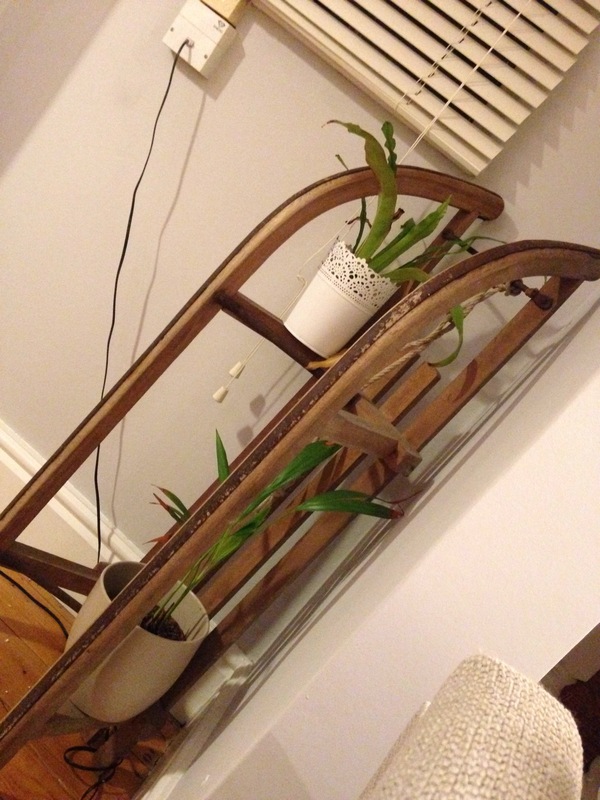 I’ve been thinking about getting the blog going for ages but Christmas came (which was ages ago!) and cold winter evenings meant I didn’t really have the motivation to write anything. But the days are getting brighter and it’s filling me with do much inspiration to get crafting and start blogging again! I do, however have a list of blogs I wanted to do over the Christmas period so I will give you a brief update of what has happened since then and hope you don’t get bored of my out-of-season blogging! Sorry in advance.